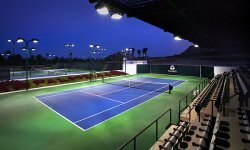 Tennis in Los Cabos�Palmilla Tennis Club, La Huerta, Pedregal all have Tennis courts available..
Palmilla Tennis Club is a unique, world-class facility—the only one of its kind in the greater Los Cabos area. PTC has been voted as the number-one tennis destination in Baja by readers of Baja Traveler magazine. In addition the the American Sports Builders Association has bestowed an award to Palmilla Tennis Club as one of the top new tennis clubs in North America.